For the Council’s deliberations on the budget for fiscal year 2013, rather than look at ways to cut expenses, I urged them to consider new or expanded sources of revenue to maintain and enhance existing city services (particularly the parks and recreation, historic preservation, and public art programs) that make Rockville a distinctive place to live and work. Of course we need good roads, a responsive police department, regular trash pickup, and clean water–those are basics but they don’t make Rockville distinctive and prevent the monotony that’s so much the norm of suburban living. 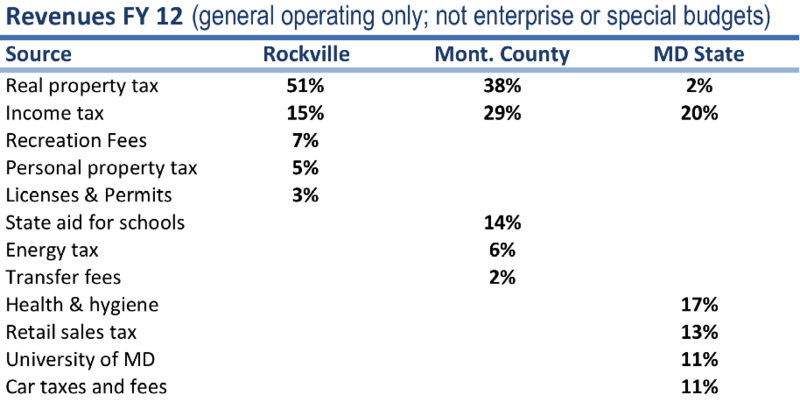 A comparison of the top five revenue sources among the city, county, and state suggests some opportunities (btw, the city budget presentation is a dreamcompared to the county and state). 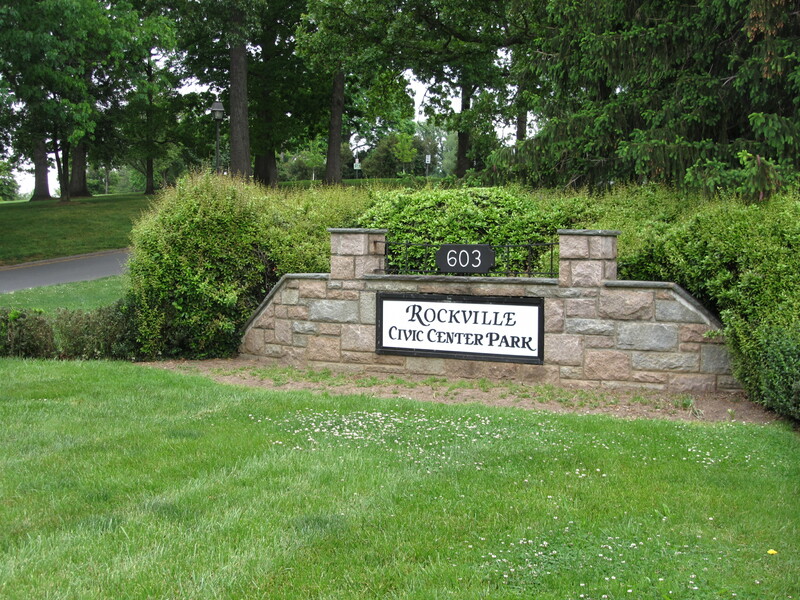 Entrance sign for the Rockville Civic Center Park. 1. Examine the Real Property Tax Rate. Property tax is the major source of revenue for the City (it accounts for 51% of total revenues), and as the budget already recognizes, the decline in property assessments means a significant decline in General Fund revenues and it is anticipated this decline will continue into the following year. Although no one wishes to discuss raising taxes in this lackluster economy, we did reduce the rate three consecutive times when the economy was strong a few years ago and perhaps it’s now time to recognize we need to maintain our revenues in order to maintain the high level of services we’ve come to expect as residents. Perhaps it is appropriate to increase the tax rate to a previous level or adopt a “constant yield tax rate” (discussed on page 3-8 of the Budget)—in either situation I would couple it with increased efforts to show our tax dollars at work in the City. This is a technique borrowed from non-profit organizations who have to continually demonstrate to their members and supporters that their donations make a difference. In the City of Rockville, most residents wrongly believe that 100% of their property taxes go to the City (and Rockville is blamed every time the County raises the tax rate), so we should have an ongoing campaign to clarify the issue as well as show how tax dollars are being used. This could include issuing a separate property tax bill (rather than combining it with the county), including the city name and logo on all park and recreation facilities (the Civic Center Park’s entrance sign does not indicate it is owned and operated by the City), and installing large signs at all city projects (such as the new police station) stating that construction is being paid by “your tax dollars”. As residents, we need constant and varied reminders that taxes make a significant difference in our quality of life. 70% more for an annual pass for the Senior Center ($40 vs. $135). These variations make no sense and should be adjusted for consistency and appropriateness. I don’t want to subsidize non-residents at all but reduced or equal fees could be allowed under certain conditions, such as public events where it is difficult to determine residency (such as the Wine Festival); children who participate in free or reduced meal programs at schools (let’s be charitable); or for Rockville-based group or league activities, such as softball or orchestra (so all needed positions can be easily filled so the activity can proceed). 3. Seek Additional Revenues from Businesses, such as sales tax, personal property tax, or a different tax rate on properties in certain zones. Sales tax can be a major source of revenue (as demonstrated by the State of Maryland) and Rockville currently has nearly 2 million square feet of shopping centers, however, it collects no sales taxes unlike cities in 38 other states—but this may require approval by the State, a long and difficult road. Personal property tax (it can only be levied on businesses so it’s akin to a business income tax) is a major source of revenue for the City, however, it is stifled because the Council has enacted significant exemptions (see page 3-9 of the Budget). It is a tax structure based on the industrial age (it taxes the inventory and physical assets of businesses) and may not be a longterm solution (the City’s largest employers do not hold significant resale or manufacturing inventory) but it’s a unique source of revenue for the city, yet we hardly take advantage of it (the state only collects an annual $300 fee and the county doesn’t collect personal property tax). Perhaps the most appropriate and feasible is a separate real property tax rate for industrial, commercial, or mixed use zones, an approach we already use in Town Square and the Town Center Parking District. 4. Examine the Pension Plan’s impact on the City Budget. I have heard rumors that there are continuing shortfalls between the Pension Fund assets and longterm liabilities which have required the City to contribute millions more than expected, however, specifics are difficult to identify (the agendas and minutes of the Retirement Board lack sufficient detail and the agenda from the most recent meeting on March 23 wasn’t even posted) and the fiscal impact of this shortfall is only tangentially mentioned in the City’s budget. Pensions are an important benefit and may be subject to negotiation with employees and their unions, however, I am concerned that our current pension plan is unnecessarily threatening the financial stability of the City, as they are in so many other municipalities across the nation (including Montgomery County). 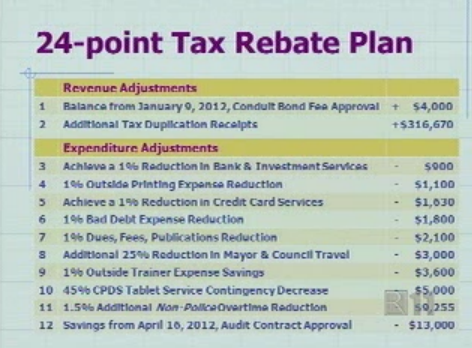 Councilman John Hall’s 24-Point Tax Rebate Plan presented on May 7, 2012. Observing the Mayor and Council discussion on the budget on May 7, 2012 suggests that Councilmembers Pierzchala, Moore, and Newton are taking a thoughtful approach, asking good questions, weighing successes and threats, and looking into the future as well as the current year. Councilmember Hall, on the other hand, seemed to have spent his time on a futile exercise to create a “24-Point Tax Rebate Plan” to cobble together $1.5 million for a $100 homeowner’s tax credit. It turned out that some of his numbers were wrong (e.g., he estimated the savings from the city manager vacancy would be $35000 but it’s actually closer to $10000), were pulled from capital projects (so couldn’t be used and additional funds would be needed), would run so close to the edge of our reserves that it would be impossible to continue for a second year, and that the Council had already voted on January 30 not to provide a homeowner’s credit. I really wish he would have spent his energies on tackling the capital improvements backlog, getting more support for community groups, or figuring out how to resolve the property tax revenue shortfalls, and not spending time at a Council meeting on a plan that wasn’t ready to be discussed. An excellent overview and detailed information. Going forward the sales taxes and differential business property tax are critical if Rocville is going to meet its future costs as an urbanizing community. Additionally, with 10% of our potential property taxes lost to government and institutional uses, the City needs to pursue “payment in lieu of taxes” from County, State & federal governments.